The move comes the day after Alex Salmond and Nicola Sturgeon unveiled the paper at a media launch in Glasgow. 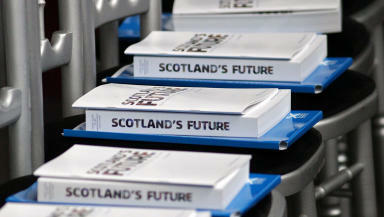 MSPs will be asked to endorse the Scottish Government's White Paper for independence in a Holyrood debate. First Minister Alex Salmond will take the formal White Paper to the Scottish Parliament a day after its launch before international media in Glasgow. The document, which runs to almost 670 pages, sets out the SNP administration's aims for negotiating terms after a Yes vote on September 18 next year. It confirms that ministers are relying on keeping the pound as currency, shared with the rest of the UK, and that it is working towards seamless transition to European Union statehood. The document also indicates what an SNP Government would do if re-elected in 2016, including pledges to improve childcare, scrap the so-called "bedroom tax" and remove Trident nuclear missiles from Scotland. Mr Salmond, unveiling the paper on Tuesday, said the long-awaited blueprint is a "mission statement" for changing the country for the better. He said: "Our vision is of an independent Scotland regaining its place as an equal member of the family of nations. "However, we do not seek independence as an end in itself, but rather as a means to changing Scotland for the better." The document is split into sections, some of which are already under Holyrood control, such as health, and others that are reserved to Westminster, such as defence and immigration. It shows the SNP has no plans to increase taxes on the oil industry while hoping to put money aside in a Norway-style oil fund. Childcare is a central plank of the plan, with a pledge to provide 600 hours provision to around half the country's two-year-olds in the first independent parliament. By the end of a second term, the SNP wants to extend provision to all children aged from one to school age will be entitled to 1140 hours a year. Critics said the proposal is uncosted and that the Scottish Government already has the power to make changes. The White Paper also shows that migrants would be encouraged to Scotland with more relaxed entry rules to help boost the working population. Better Together leader Alistair Darling, a Labour MP, dismissed the document, saying nothing has changed. He said: "It is a fantasy to say we can leave the UK but still keep all the benefits of UK membership. The White Paper is a work of fiction. It is thick with false promises and meaningless assertions." Scotland Tonight will have an hour-long Scotland Tonight Referendum Special on Wednesday. The third major debate with Deputy First Minister Nicola Sturgeon and Secretary of State for Scotland Alistair Carmichael will be broadcast at 10.55pm.